This one was something a little special. Let’s check my notebook. “The blend of soft boiled egg and asparagus isn’t so much a flavour as a caress,” I apparently noted. A bit further down the page, I went for “it would be a well-oiled machine, if that phrase wasn’t so impersonal.” Discussing the lamb, I volunteered that it was “shocking to think that a taste this vibrant could spring forth from dead tissue”. And by the time I was scrawling down phrases such as “it’s like each molecule of each dish represents the Platonic form of food, and only the way that they are arranged determines the meal’s corporeal manifestation,” it’s entirely possible that I may have been starting to lose the plot. Working (arrogantly) on the assumption that you know of my recently-acquired part-time job as a freelance restaurant reviewer, you’ve probably already got a notion of what’s going on here. I am, indeed, talking about a restaurant. I’ve been holding off from blogging the death out of each and every place I visit, on the basis that an occasional entry summarising the job over a period of time will probably hold far more interest. But on that basis, I couldn’t really go into depth on any single experience for more than a paragraph or so, and this place, if it’s going to be journalised at all, deserves an entry unto itself. It was called the Buffalo Club. The name apparently refers to the name of old fashioned gentlemen’s clubs which used to exist in the cities of Australia — exclusive, members-only places, furnished with dark wood and leather. Of course, when I rang the club to arrange to meet the manager, I didn’t know this. In fact, I didn’t even get to speak to him — instead, I was greeted with an answering machine. A call back the next morning, though, was immediately hopeful. The manager, a delightfully chirpy man named Daniel, asked what days would suit me. Friday would be good, I responded, and asked him what time suited them. Seven o’clock. So would that be seven AM, or seven PM? Well, PM, of course, replied Daniel. That is, assuming I wanted to try the food…? I had to explain at this point that the restaurants I visit aren’t required to give me anything gratis at all (they often don’t) but Daniel amicably invited me to “sample a couple of courses” anyway. Superb!, thought I, and went away grinning. Free dinner on Friday night was a concept I was happy with, and at a place called the Buffalo Club, too… my mind filled with images of huge sizzling steaks, barbecued ribs. I didn’t actually realise until I overheard the couple at the next table along having their starters explained to them that I wasn’t the only one whose menu was being selected by the house. Everyone’s was. 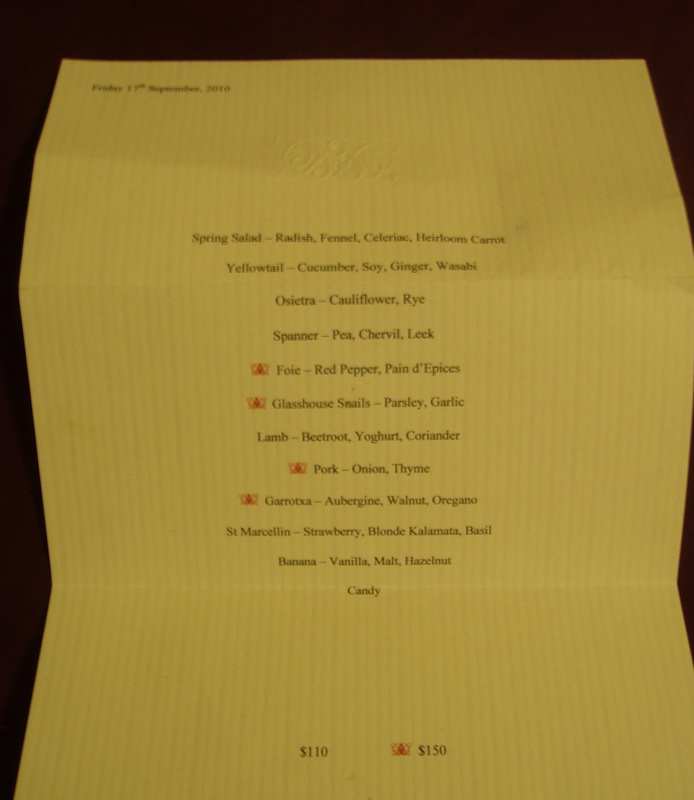 The theme of the Buffalo Club, it transpired, is that the guests are offered a set menu for a set price — $110 for an eight-course meal, $150 for twelve, with wine $70 or $100 extra. To put that in terms that the queen (and, um, the rest of you back home) would understand, that’s around £100 or £150 altogether. The selection I was offered came to six courses, with one glass of wine — not quite the full whack, but sliiiightly higher-standard dining than I would have been making for myself at home. The restaurant felt expensive, too — another of those notes of mine observed “I wonder if they would sling me out if they knew my shirt cost three quid?” — but in the classy, lustrous sense of the term. That wooden and leather décor was immaculately framed by dark, shining plate-glass and dark, shining pot-plants, overlooking the corner of two streets in Brisbane’s night-time heart, Fortitude Valley. A doorman outside the understated entrance was expecting me by name, and Daniel himself was ready with a handshake when I stepped out of the lift. He would also, it turned out, be one of my two waiters for the night; not a special buttering-up of the reviewer, but a service given to all diners (and quite right too at that price, I can understand you thinking). But this was also a service born of necessity… no minimum-wage hired hand could have been expected to pull off quite such a degree of explaining. This was food which required quite some explanation. Which brings me back, at last, to the food. The first remarkable thing about the set menu was that it changes every day — a different set of 12 courses cooked up every single day. With some repetition, obviously, but nonetheless, if you could somehow afford to drop by every evening, you’d never eat quite the same thing twice, with the menu dictated by what ingredients are in season at the time. 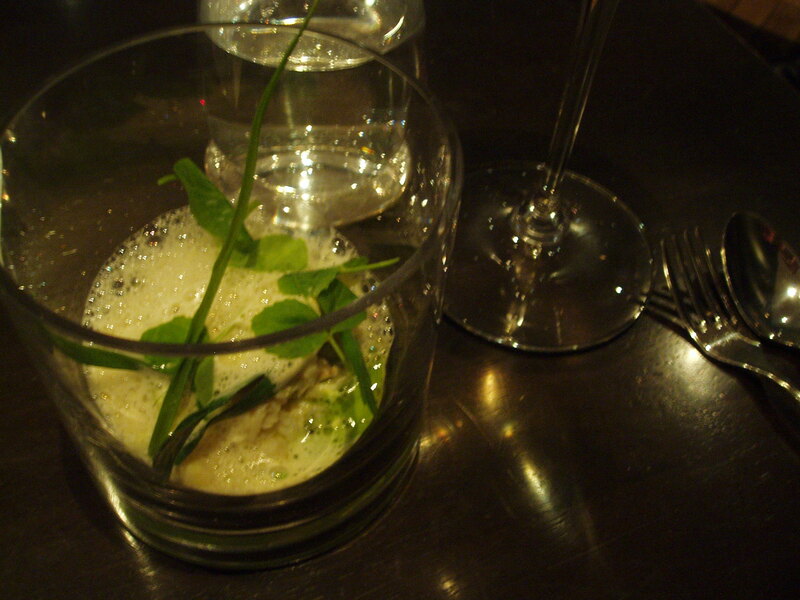 What was in season for starters on Friday September 17th, apparently, was chilled artichoke soup (served in a test tube! With a cork! ), and the asparagus with soft-boiled quail (quail!) egg mousse which I referred to up the top. These dishes, you’ll notice, are slightly unusual. This theme continued. Spring salad with miniscule slivers of radish, celeriac and heirloom carrot. Yellowtail with pickled ginger, cucumber and wasabi. The incredible main course — two little slivers of lamb (“raised on saltbush,” explained the waitress, “so it’s naturally seasoned.” This is one of the best things I’ve ever heard) with buffalo yoghurt, dehydrated beetroot and coriander. A bizarre dessert consisting of “salt and pepper pineapple”, spiced rum, and some sort of freezing cold white foam which my head is too stuffed with odd ingredients to remember what it was. Banana chips with a delectable fried doughnut and vanilla malt creams. The final course was a strawberry milkshake and an aniseed lollipop. And oh, the taste! I’m sorry, I know I’m drooling on here, but it was all truly, incredibly delicious. Daniel didn’t like the phrase “molecular gastronomy” à là Blumenthal, but there were similar shades of experimentation in the cookery — the dehydrated beetroot, for example, and the emphasis throughout on odd textures and unexpected contrast. Christ, though, it worked. I spent forever on every mouthful, just enjoying. The meal was somehow narrative, too — soft tastes in the starter gave way to tang in the salad, in time to set up the meaty savour of the lamb, before a contended slide back into softness by dessert. The lollipop was half a joke, I think, but it felt oddly perfect to end a night of such incredible food by sitting back and sucking on a lolly like a contented child. I have to condense all this into a concise, professional review for bestrestaurants, which means wading through my ten pages of overawed notes for phrases that actually make sense — “each dish is not so much an artwork as a palette; the brushstrokes of the tongue do all the rest” is quite nice. Here and there, I’m less coherent: one of my favourite notes reads “even the cutlery. Even the cutlery.” I really hope that I can do the place justice — even without all the fluff of décor and location and classy little gimmicks, the food was incredible. Sure, I’m sure these places know just how to schmooze a reviewer, but I wouldn’t have been half so schmoozable if my taste buds weren’t actually imploding with happiness. It made me overjoyed yet again at having landed this job — there’s no way I would ever have got past the doorman of a place like this otherwise. It was extraordinary, an almost overwhelming experience. Maybe soon I’ll be all cynical and jaded in this job, and unable to take such childlike wonder from a restaurant — but if so, I’m glad I got to do the Buffalo Club before the ennui sets in. It was amazing, in every way. Brilliant blogging – as good as the food. maybe as good as the cutlery.